This is the album that got me through the winter of '97. In the summer of 1996, I took a trip from my native D.C. to the West Coast, to decide where I wanted to live. L.A. was too much like D.C., just with more sunshine -- everyone rushing around in mindless obeisance to a fame-money-power-based dominant industry, and no real local character to the place. San Francisco was just too damn expensive for my economic situation at the time (OK, and, uh, today too). Seattle was too bloated, having exploded in size over the previous decade with no clue as to how to manage little things like traffic, development, environment, etc. ; besides, it reminded me of a sprawling East Coast city, just with more trees. But when I got to Portland, I always describe it as my "Goldilocks experience" -- it felt juuust right. And along with the good friend I visited there, that weekend I went up to the lovely Vancouver, B.C. (also a sprawling metropolis, but reminiscent, rather, of a European city) to attend the sublime Vancouver Folk Music Festival, which was a real eye-opener as far as what can be achieved through music and community. My one life-changing discovery there (besides all the great Portland people I met, which sealed the deal of my moving there the following year!) was the amazing singer-songwriter Dan Bern. More on him another time, perhaps. But another favorite act I caught there was The Henrys, a quartet performing oblique and wittily-titled instrumentals centered around Don Rooke's Hawaiian guitar. That winter, I was back in D.C., feeling very far away from my newfound Portland friends and the magic and fellowship I'd experienced there. 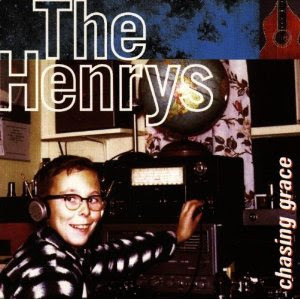 So I was surprised and delighted to come across The Henrys' CD in my local secondhand shop -- it was like a secret message from the summer before. Especially when, a week or so later, I came down with the flu, and was in bed with a high fever for a few days. Something about that loopy Hawaiian guitar and the weirdness of Mary Margaret O'Hara's wordless vocal contributions made Chasing Grace the perfect soundtrack for my fever dreams. It reminded me of my friends and the festival, and of the fact that I'd be returning to Portland to live that coming summer. I've been here ever since. I hope this unique band helps you, friends, get through the winter of '11 -- but hopefully not the flu, too! P.S. Gotta love that cover photo! Been looking for this for a very long time. Thank you! Never heard of these guys, tho a big MMOH fan. Looking forward to the Dan Bern posting. Seen him a few times live... brilliant and brave. Why he's almost invisible on the blogosphere is a mystery. Wow. Great stuff. I'll be listening to this a lot. Thanks for the introduction. Big thanks, this is just great! Ayone seen any more Henrys out there? Great stuff.. Thanks! On a Mary Margaret O'Hara note.. I remember seeing her on UK TV back in the late 80's.. I think it was Jonathan Ross show on Channel 4. She did a beautiful version of 'Dear Darling' with just steel guitar and acoustic bass backing. I'd love to see that again.. hope someone's got it somewhere. Sssshhh. Stop talking about Portland or it'll end up like Seattle. But thx for the music.